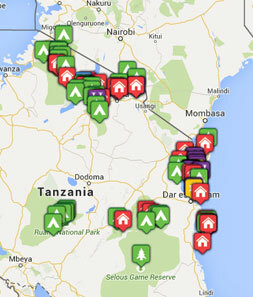 Tribes Overall: "Since I have used Tribes to organise the previous three trips I have made to Tanzania, their expertise is taken for granted. However this year the rains in the region were unprecedented and arrangements made, had to be remade on hours notice. Christine managed it brilliantly and the whole trip went swimmingly - appropriately, given the amount of water there was about. " Tribes Service: "Christine was completely knowledgeable and really helpful in planning the trip. Guides: "The best guiding was in Ruaha with Jimmy, at Mwagusi River Camp. The Masai guide at Rufiji River deserves a special mention too - excellent birding and great knowledge." Social & Environmental Responsibility: "I visited the NGO at Mufindi which I had not thought would be a highlight, but it was. Getting up to Kitulo was a real challenge, but (with the benefit of hindsight) worth staying in the local village for." Since the camp was pretty much washed away, and I did not get to stay there, it has to have been terrible, right? actually this is unfair, as I was put up in the very comfortable Rufiji River Camp which was no great hardship at all, and the birding in the area was great. "The sheer adventure of it all as well as the considerable relief getting back alive and in pretty much one piece, all thanks to Christine and the wonderful people she contacted on the ground in Tanzania"